Ty4-13 in Gdańsk, October 1961. Photo from my collection. Side drawing of the BR44 in its original variant, by M. Kratochvil (source: TB vol.1). Side drawing of the BR44ÜK with the 2’2’T32 tender in PKP service by M. Ćwikła (SK 4/2001). TCDD 56712 (Batignolles 747/1945) at the Çamlik locomotive museum, Turkey, September 30, 2007: it is virtually impossible to take a better picture! 44 004, DRG, BMAG 8529/1926. This is an engine from the initial batch. Photo from my collection. Two-cylinder competitor: 43 020 (Henchel 21000/1928). Photo from my collection. 44 0093-3, DB, formerly 44 1093 (WLF 9449/1942), photographed with a special train near Gernrode, Germany, on January 3, 1999. Photo by Volker Jacobi (postcard from my collection). This 44 1568 from the DR fleet (formerly 44 0568, Borsig 15407/1942) was photographed somewhere in Eastern Germany, probably on May 15, 1966. Photo from my collection. DRG 44 382 (Esslingen 4447/1941), photographed somewhere in south-western Germany, summer 1942. This engine was withdrawn from DB in September 1960. Photo collection Martin Stertz. Another BR44 from the DR fleet: 44 9991 (formerly 44 991, Grafenstaden 7814/1942, converted to coal dust firing in 1957 and withdrawn in November 1974), location and date unknown. Photo from my collection. 44 1144, DB, Borsig 15193/1942, location and date unknown. This locomotive survived in service until March 1974. Postcard from my collection. 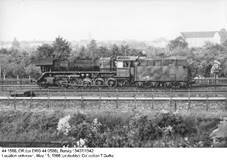 This locomotive (Creusot 4764/1945) was ordered for DRG as 44 1519, but completed for SNCF and numbered 150X1519. Later re-numbered 150X3, it was withdrawn in April 1959. Source: www.commons.wikimedia.org. DRG 44 661 (Borsig 15117/1941) remained with DR after the war and was sold to ÖGEG in 1992. Lokpark Ampflwang, August 25, 2016. 044 508-0, DB, Krauss-Maffei 16113/1941, photographed in Essen on May 14, 1977. Twelve days later this engine was withdrawn from use; currently it is owned by Westerwälder Eisenbahnfreunde. Postcard from my collection. DRG 44 002 (Henschel 20458/1926), probably a factory photo. This engine served with DB until March 1965. Source: Die Lokomotive April 1927. 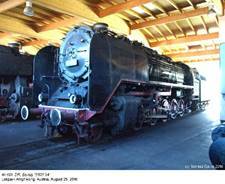 22,000th locomotive from Henschel was 44 011, built in 1933. Initially designated M02 1004, due to experiments with higher boiler pressure (‘M’ stood for Mitteldruck, or medium pressure). Withdrawn from DB in December 1950. Probably a factory photo; source: Die Lokomotive July 1933. Two DR locomotives: 44 0167-5 (ex 44 167, BMAG 10983/1939) and 44 0797-9 (ex 44 797, Fives-Lille 4965/1942), photographed at the Nordhausen depot in 1980. The former was withdrawn in March 1992 and transferred to Dampflokmuseum Hermeskeil; the latter was withdrawn in February 1982 and scrapped. Photo by G. Feuereißen (postcard from my collection). DR 44 9400 (ex DRG 44 1400, Schichau 3592/1942), Saalfeld, Germany, May 1971. This locomotive was converted to coal dust firing in 1951 and re-numbered in 1970; it was withdrawn in October 1973. Photo by Winfried König (from my collection). 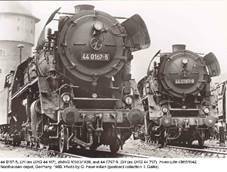 In early1920s the most powerful freight locomotives in the DRG (Deutsche Reichsbahn Gesellschaft) service were ex-Prussian three-cylinder G12s, re-classed 5010-12. In fact, class G12 had set a pattern for a Decapod which was to dominate freight traffic in Germany (and large part of Europe) until the end of steam era. 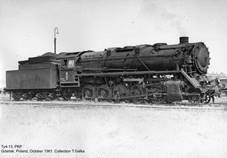 These excellent engines, of which about 1,500 had been built, had a tractive effort of 18.2 tonnes and their maximum speed was 65 km/h. Both these figures soon were found insufficient and plans were laid down for faster and even more powerful freighters. While both railway authorities and locomotive manufacturers agreed that the 1-5-0 axle arrangement should be retained, first tentative design studies included two-, three- and four-cylinder machines. Four-cylinder compound was finally rejected due to complexity and it was decided to purchase single-expansion engines, ten two-cylinder BR43s and ten three-cylinder BR44s being ordered for service evaluation. 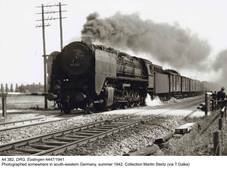 BR44s were supplied in 1926 by Henschel (44 001 through 003), Schwartzkopff (44 004 through 009) and Esslingen (44 010); two-cylinder engines followed in 1927 from Henschel (43 001 through 005) and Schwartzkopff (43 006 through 010). First results were inconclusive. With almost the same rated power, economy of the three-cylinder engine was found poorer than expected and in fact BR44 was slightly better only at the highest indicated power, above 1500 hp. Ease of manufacture and maintenance favored BR43 and 25 more examples were supplied by Henschel (18) and Schwartzkopff (7) in 1927 and 1928. Service experience was, however, not entirely satisfactory (failure rate turned out to be rather high) and no more orders followed: three-cylinder freighter finally emerged as a winner. In 1933, Henschel built 44 011 and 44 012 which differed considerably from their predecessors: these were in fact experimental machines with boiler pressure increased to 25 bar and four-cylinder compound engines. Despite high power (about 25% higher than in first examples) and very good economy these locomotives suffered from maintenance problems and further experiments were abandoned. Production engines, built from 1937 onwards, initially by Henschel, Schwartzkopff and Krupp, differed substantially from the first ten examples. Copper firebox was replaced by a steel one, boiler pressure was increased from 14 to 16 bar, cylinder diameter was reduced from 600 to 550 mm, Riggenbach counter-pressure brake was deleted and large, Wagner-type smoke lifters were fitted. First 53 examples were considered an interim variant (Zwischenausführung). From 44 066 onwards, several modification were introduced; in particular, grate area was slightly reduced and third cylinder valve actuation mechanism was modified. This variant remained in production until late 1942. In 1940, Polish Fablok company of Chrzanów (renamed Oberschlesische Lokomotivwerke AG) undertook production of this locomotive, eventually supplying 145 examples until 1943. However, until 1941 production rate remained quite low. After the attack on the Soviet Union and resulting rationalization of locomotive procurements it increased considerably, but it was decided to transfer BR44 production entirely to French factories. Last German-built examples were delivered in 1943. Five French companies (Creusot, Fives-Lille, Batignolles, Cail and SACM aka Grafenstaden) delivered 693 BR44s until 1946; of these 226, completed after termination of hostilities, went directly to SNCF as class 150X. During the production course, from 44 786 (Fives-Lille 4954/1942) onwards, basic design was gradually simplified. In particular, smoke lifters were deleted and driver’s cab was modified. Later variants were referred to as BR44ÜK (Übergangs-Kriegslok, or interim wartime locomotive). They featured simplified components and more crude machining; externally they could be distinguished by removed smoke lifters and front cab windows. Last ten examples were assembled for DR at the former Borsig plant in Hennigsdorf (44 1231 through 1240), bringing the grand total to 1989 machines. After the war, Deutsche Bundesbahn were left with 1242 examples. Contrary to many other Kriegsloks, notably BR52, they were kept in service for quite a long time, surviving until the end of steam era in Western Germany in 1977. Five machines (all representing the standard pre-war version) were fitted with new, welded boilers, coal feeders (removed between 1964 and 1968) and rocking grates. Five more received new boilers and feedwater heaters. 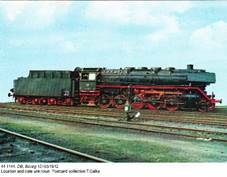 In 1955, 44 475 (Henschel 26084/1941) became the first DB steam locomotive to be converted to oil firing. 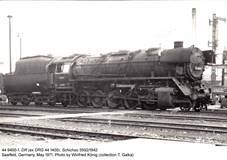 31 more followed and these engines, re-designated class 043, were in fact the strongest German steam locos in service and one of the last to be withdrawn. In Eastern Germany, DR had 335 examples, but experienced some problems with fuel. Despite comparatively large grate, BR44 was demanding as far as coal quality was concerned, and DDR had very limited resources of high-grade coals. Solution was sought in coal dust firing systems and in November 1951, 44 506 (Krauss-Maffei 16111/1941) was suitably modified. This conversion was basically successful and 21 engines followed (they were coupled with modified 2’2’T31.5Kst tenders), but service experience, due to dust accumulation and frequent flashbacks from the firebox, was somehow unsatisfactory and these locomotives survived in service only until 1975. 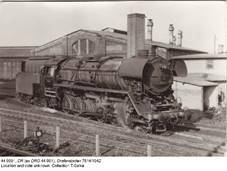 As with DB, 44 195 (Krupp 2017/1940) became in 1959 the first DR steam loco converted to oil firing. Until 1967, a total of 94 examples were similarly converted, some receiving entirely new boilers, but in early 1980s, due to substantial increase of oil prices, 58 of them were re-converted to coal. In 1970 DR locomotives were re-classed 44 0 (oil firing), 44 1 and 44 2 (coal firing) and 44 9 (coal dust firing), their service numbers being changed accordingly. Last 44s in the DR service survived until 1987, some remaining in use for a few more years as stationary boilers. BR44s were also used in several other countries. In France, SNCF found this type particularly useful for heavy freight trains and, apart from a number of engines taken as war booty, acquired the above-mentioned 226 examples from French factories. On the other hand, the Soviets found BR44 too complex and demanding in maintenance, so only eight served briefly with MPS. Of eight machines taken over by ČSD in Czechoslovakia, four were handed over to Poland; the rest probably saw no service and were scrapped in late 1950s, without any service designation assigned. In 1955, 48 French machines, made redundant by electrification of many principal lines, were sold to Turkey, when they were given TCDD service numbers 56701 through 56748. 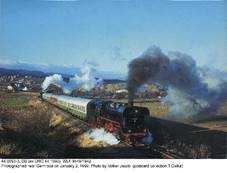 They remained in service until late 1970s and hauled even heavy passenger trains. Apart from France, Poland was the largest foreign user of this type. This is hardly surprising, as heavy freight traffic was typical for PKP even before the war. According to data quoted in a monographic article by Roman Witkowski and Paweł Terczyński (SK vol.4/2001), Polish authorities took over about 140 BR44s (PNPP gives 139). In 1946, 126 were classed Ty4. One of them (Ty4-39, ex 44 688, WLF 9275/1941) was badly damaged and finally scrapped in 1954. Later six more machines were included, but of these only two were actually restored in service. Seven more were scrapped in 1946 without being given PKP service numbers. Of 132 BR44s which were given PKP service numbers as many as 42 had been built by Fablok. 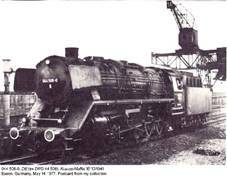 Until the arrival of first ‘Trumans’ (class Ty246) from the USA in March 1948, Ty4 was the most powerful locomotive in the PKP service and these engines operated mainly on the Coal Trunk Line between Upper Silesia and Gdynia on the Baltic coast. Superseded byTy246s and later also Ty51s, they disappeared from this line, but soldiered on elsewhere. Later many were used as heavy switchers, often with smaller tenders. Repairs of these engines were complex and time-consuming, as their three-cylinder layout made them untypical and suitable maintenance facilities were scarce. Availability rate was thus, at least initially, quite low. Modifications were rather few and included normalized fittings and various items of equipment. Some examples were fitted with circulation tubes and rocking grates. Large, Wagner-type smoke lifters, typical for early examples (and for many other German Einheitslokomotiven) were usually removed; on the other hand, many Ty4s were fitted with small, narrow Witte-type smoke lifters. As with DB and DR, there were also conversions to oil firing. First experiments were successful and over sixty engines were converted between 1964 and 1965. In service, they outlived their coal-fired kinsmen, but not for long. Withdrawals started in 1970 and went on quite fast: on January 1, 1977, only sixteen Ty4s remained in the PKP rosters and the last of these, Ty4-17 (Borsig 15047/1941, ex DRG 44 366) was written off in December. Many were sold to industrial establishment, to serve as stationary boilers, and continued in this inglorious role for a number of years, but none was preserved. Last examples were scrapped in 1993, despite many protests from Polish railway fans. Fortunately, if they want to see a BR44, they don’t have to go too far: as many as 51 examples have been preserved in Germany, plus two in Austria (ÖGEG, Ampflwang) and one in The Netherlands (Veluwsche Stoomtrein Maatschappij, Beekbergen). 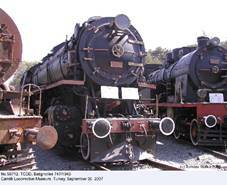 Keener travelers may also add Turkey: TCDD 56712 (Batignolles 747/1945, ordered as 44 1832, then SNCF 150X82) has been preserved at the Çamlık Buharlı Lokomotif Müzesi. 4) Including five not restored in service. 5) 44 005 attained 1620 hp during tests. - http://www-personals.umich.edu/~khmiska (website by Kurt H. Miska – unfortunately no longer active).